The New England Patriots remain at home at Gillette Stadium for the AFC Championship Game against the Jacksonville Jaguars. This week’s game will be broadcast by CBS on Sunday, January 21, at 3:15 p.m. ET and can be seen on WBZ-TV Channel 4. Jim Nantz will handle play-by-play duties with Tony Romo as the color analyst. Tracy Wolffson will work from the sidelines... The game will also be aired on the Patriots flagship radio station 98.5 The Sports Hub with Bob Socci and Scott Zolak on the call, produced by Marc Capello. The Patriots (14-3) took care of business in easy fashion by easily dispatching the Tennessee Titans 35-14 last Saturday night. The Jaguars (12-6) jumped out to a huge 21-0 lead over the Pittsburgh Steelers and then kept the heat on the Steelers defense by gouging them for 45 points in a 45-42 win in Pittsburgh. The Patriots and Jaguars have a limited history against one another since Jacksonville entered the league in 1995. Sunday’s game will only be the 12th time the two teams have met. But the conference championship game will mark the fifth time the teams have met in the playoffs. New England holds a 10-1 overall record including 7-0 at home over the Jags. The only game Jacksonville has won was a Divisional Playoff game in 1999. The teams last met in Foxboro early in the 2015 season, but not much can be gleaned from that matchup as both rosters have undergone a host of changes since them. The Patriots running game has been extremely effective since Dion Lewis has taken over as the primary running back. He and Rex Burkhead, who should return from injury this week gives New England a dynamic 1-2 punch that is effective in the passing game as they are in the running game. The Jaguars have a big, physical front and speedy outside linebackers that flow to the ball really well. But as aggressive as they are on defense at rushing the quarterback, they can be run on if you run the ball right at them. The slow developing stretch runs to the outside won’t work with the speed of the linebackers. Look for Lewis and Burkhead to run to the weakside this week. Yannick Ngakoue is a slightly undersized but athletic defensive end as they try to keep the Jaguars defense from just teeing off on the quarterback. The key from a New England perspective for the running game is keeping the third downs to manageable distances. The Patriots passing game got some of their weapons back last weekend and it was no surprise that Tom Brady threw for 337 yards and three touchdowns. Now with Burkhead back, the backs in the passing game should be able to be at full strength too with Burkhead, Dion Lewis, and James White. 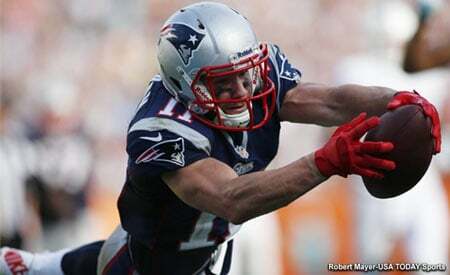 Chris Hogan, Brandin Cooks, and Danny Amendola are the outside wide receiver targets and TE Rob Gronkowski remains the big mismatch in the middle. Jacksonville’s defense allowed just 169.9 yards per game during the regular season by combining an outstanding pass rush that got 55 sacks and great coverage by their cornerbacks on the outside with A.J. Bouye and Jalen Ramsey. Calais Campbell led the way with 14.5 sacks and Ngakoue was next with 12. Look for the Patriots to mix their “11-personnel” with 3 WRs and 1 RB with Danny Amendola on the field with their “21 personnel” with 2 WRs, 2 RBs and a TE to keep the Jaguars defense guessing. With their big pass rushers, the key from NE’s perspective is to go hurry up as soon as the team makes a first down. They want to stop the Jaguars from substituting freely on the defensive line and hopefully wear them down. 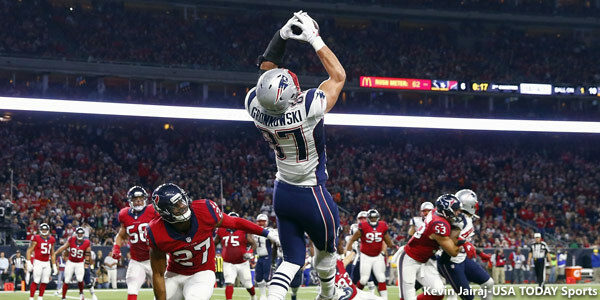 Gronkowski and the backs are the keys for Brady this week in the passing game. Both of their safeties are dinged up a little bit and look for Brady to get Gronkowski involved early and often. The running backs are the big keys for New England in the passing game. The Jaguars corners should match up well with the wide receivers outside the numbers but another big key will be the quickness of Danny Amendola inside the numbers. Brady will look to get the ball out quickly, think of the game plan against the Seahawks (which is very similar to Jax), or the Falcons defenses. The Jaguars have the top-rated running game in the league with the big man Leonard Fournette providing the bulk of the heavy lifting inside. Fournette smashed the Steelers to the tune of 109 tough yards and three touchdowns on Sunday. Chris Ivory was a healthy scratch and T.J. Yeldon is the change of pace and a good receiver out of the backfield with Fournette. QB Blake Bortles has been very effective at scrambling out of the backfield and is very good at moving the sticks when there is no one open in the receiving patterns. The Patriots struggled against the run all season and allowed 114.8 yards per game, which is coincidentally less than Jacksonville did (116.3 ypg). But in the last three games, the run defense has noticeably stiffened allowing a total of 189 yards (63 ypg). With Allen Branch and Kyle Van Noy back and healthy as well as the addition of James Harrison, it is a different unit now. Look for the Jags to try to pound Fournette as they did all season to make third-down conversions for Bortles easier where they’ll have a run/pass option. Yeldon is a bit of a wildcard here. How well the Patriots do or do not cover the run will go a long way in this one. Their game plan will be to force the ball into Bortles’ hands and make the Jaguars win that way. The Jaguars passing game is a microcosm how Bortles’ season has gone. When he has played well, the Jaguars have been very difficult to stop. And when he’s not, he’s looked at times awful. He had a poor playoff game against Buffalo which he turned around and had a very solid game against the Steelers. With Allen Robinson on IR, the Jags have Marquise Lee, Allen Hurns and rookie Keelan Cole who shined when he was here during the joint practices/preseason game this summer. Tight end Marcedes Lewis is their leading touchdown receiver with five and provides a good weapon in the middle of the field.The aforementioned Fournette and Yeldon give Bortles good but not great weapons in the passing game. The Patriots secondary has been much much better since the first month of the season. They have a trio of good corners in Stephon Gilmore, Malcolm Butler, and Eric Rowe. The pass rush has heated up down the stretch and had a franchise record eight sacks against Tennessee last week. Look for Bortles to play action pass on first down a lot here, trying to catch the defense selling out to stop the run. That is a key for both teams this week. If the Patriots can force the ball into Bortles’ hands in constantly having to throw on third down, that’s the matchup the Patriots will win. The edge rushers must stay disciplined and not get past him to allow scrambling for first downs. The Patriots’ Special Teams continue to be among the best in the NFL, they excel in punt and kick coverage and continuously turn in big plays. Stephen Gostkowski had a very solid season and his kickoffs consistently put opponents deep in their own end. Ryan Allen is very adept at pinning opponents inside the 20 and the team has perennial Pro-Bowl ST player Matthew Slater on the coverage units. The Jaguars punter Brad Nortman had a punt blocked against the Steelers last week, something that STs coach Joe Judge may opt to try again. The Jaguars have good return teams and solid coverage teams as well. But at home, the nod goes to NE and Gostkowski who has had a very solid season. Well with the hoopla around Tom Brady’s hand/thumb injury the past few days, unless rule him out, I’ll assume he’s playing and will be his usual self. Since his ACL injury in 2008, when the last time that Brady missed a start? Exactly. This should be a good chess match as both teams will jockey for field position to give their offenses a shorter field. Brady has faced similar defenses like the Jaguars run against the Seahawks in the past, I look for them to go hurry up as soon as they make a first down. The Jags corners and pass rush are very tough obstacles but as we’ve seen Brady will try to get the ball out in two seconds or less as they slowly work the underneath and middle routes, targeting the linebackers and safeties in coverage with Gronkowski and the trio of running backs. Danny Amendola may be the forgotten man in terms of defensive game planning, but he always rises to the occasion in the playoffs. And this is a battle-tested unit. This entry was posted in 2017 Patriots Postseason, Patriots Commentary, Patriots News and tagged 2017 Patriots Season, AJ Bouye, Bill Belichick, Blake Bortles, Calais Campbell, Chris Hogan, Danny Amendola, Dion Lewis, Jacksonville Jaguars, Jalen Ramsey, James Harrison, James White, Leonard Fournette, Malcolm Butler, New England Patriots, NFL, Patriots, Patriots edge rushers, Rob Gronkowski, Stephon Gilmore, Tom Brady, Trey Flowers on January 19, 2018 by Steve Balestrieri. Patriots – Cardinals Keys to the Game, Who Has the Razor’s Edge? The New England Patriots begin the 2016 season on the road with a Sunday Night Football appearance on NBC against the Arizona Cardinals. They’ll be starting the season with a QB other than Tom Brady for the first time since 2002. Jimmy Garoppolo makes his first NFL start against a team that many are picking to go to the Super Bowl. The Patriots (12-4) won the AFC East a year ago before losing to the Denver Broncos in the AFC Championship Game. The Cardinals (13-3) won the NFC West before losing to the Panthers in the NFC Championship Game. 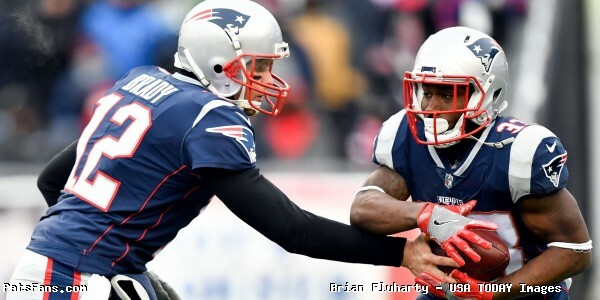 We here at PatsFans.com are continuing our “Razor’s Edge” column in 2016 to give a quick break down on some of the key matchups of the game and what you can look for in how the game plays out. The Patriots and Cardinals have met very few times over the years. This will only be the 14th meeting between the two teams with the Patriots holding a 7-6 advantage overall. The teams have split the previous eight games in Arizona but the stakes between the two teams has never been higher than this week. The last meeting in Foxboro in 2012 was a great matchup. The Cardinals under then-QB Kevin Kolb defeated the Patriots 20-18 as their defense was outstanding on that afternoon. The Patriots missed a two-point conversion to tie the game and had a chance to steal a victory with a last minute Stephen Gostkowski field goal. But his kick was well off the mark and the Cardinals held on. This entry was posted in Patriots Commentary, Patriots News and tagged Arizona Cardinals, Bill Belichick, Bruce Arians, Calais Campbell, Carson Palmer, Chandler Jones, Danny Amendola, David Johnson, Dion Lewis, Dont'a Hightower, Jabaal Sheard, Jimmy Garoppolo, Julian Edelman, LaGarrette Blount, Larry Fitzgerald, Malcolm Butler, New England Patriots, NFL, Patrick Peterson, Patriots, Patriots edge rushers, predictions, Rob Gronkowski, Rob Ninkovich, Tom Brady, Trey Flowers on September 9, 2016 by Steve Balestrieri. The Patriots 2016 season kicks off with a Sunday night prime time match-up against the Arizona Cardinals. The will be televised nationally by NBC with Al Michaels and Cris Collinsworth on the call and Michelle Tafoya handling sideline duties. Kickoff is slated for 8:30 p.m. The Cardinals (13-3) have one of the most explosive offenses in the NFL. They finished the regular season a year ago with the #2 scoring offense in the NFL with 489 points (30.6 ppg) and the #7 scoring defense allowing just 313 points (19.6 ppg). Head coach Bruce Arians and GM Steve Keim have built a very impressive football team and they made it to the NFC Championship Game a year ago before falling to the Carolina Panthers. Arizona feels like they a team still on the rise and many experts pick them to represent the NFC in the Super Bowl this season. Carson Palmer had a terrific year completing 342 – 537 passes (63.7 percent) for 4671 yards with 35 TDs and just 11 INTs for a passer rating of 104.6. With a talented cast of skill position players around him, he was very impressive a year ago. The defense is deep, talented and extremely fast. They like to bring pressure and create turnovers. It was a subject that Bill Belichick spoke about this week. Cards Aren’t Just a Passing Team, David Johnson, Key Defensively: When people mention the Arizona offense, visions of Palmer throwing the ball immediately come to mind…and rightfully so. But the Cardinals have a very balanced attack and run the ball extremely well. The guy the Patriots will have to stop is David Johnson. Johnson is 6’1, 224 pounds and is a true dual threat. He averaged 4.6 yards per carry in 2015 and had eight rushing touchdowns. But for a big back, he’s shown that he can catch the ball out of the backfield as well, adding 36 catches for 457 yards and four more scores a year ago. Chris Johnson and Andre Ellington return to the running game as well. The Patriots like to make teams one-dimensional defensively and then try to take away their biggest weapon. Trying to stop Johnson this week, may be their top priority. While their passing offense was the #2 unit in the league in 2015, having the #8 rushing offense is a big factor in opening things up. Arizona is Loaded at WR: Remember those silly days when every spring the social media world was fully of Larry Fitzgerald to New England rumors? Well, Fitzgerald is likely to finish his career in Arizona and headlines a deep and talented core of WRs. Fitzgerald, at an age (33), where most WRs are slowing down had a fantastic 2015. He hauled in 109 passes for 1215 yards and 9 TDs, breaking his own franchise record he set a decade ago. John Brown also topped the 1000-yard mark, catching 65 passes for 1003 yards and seven scores a year ago. Michael Floyd a big 6’3 target, caught 52 passes for 849 yards and six scores. J.J. Nelson has terrific speed and averaged more than 27 yards per reception a year ago. And Jaron Brown is looking like he’s trying to earn more reps this year. With Fitzgerald and many of the starters held out, had a fantastic summer. The Patriots are going to have their hands full with this receiving crew. Palmer averaged an incredible 9.2 yards per pass attempt in 2015. This is a group that will test them and test them deep. This is a big first test for the secondary. With Additions of Jones, Nkemdiche, Will the Cards Blitz as Much? Nobody blitzed more than Arizona did in 2015. The Cardinals brought the heat on about 40 percent of the opposing team’s dropbacks. Part of that was out of necessity. As talented as the Cardinals defense is, they had trouble pressuring the QB without bringing the extra man. But in a couple of moves this spring, they may feel they’ve addressed that issue. They traded a 2nd-round draft pick along with guard Jonathan Cooper to the Patriots for Chandler Jones. And in the 2016 NFL Draft, they selected DL Robert Nkemdiche. Jones had 12.5 sacks for the Pats a year ago and now, in the ‘Zona 3-4 scheme, he’s playing right outside linebacker. The team is also high on fellow OLB Marcus Golden who they’re expecting a big second-year jump from. Deone Bucannon is a player to watch as he is known for creating havoc by blitzing up the gaps. This would have been an interesting matchup had Tom Brady played. Traditionally he eats up teams that blitz, the best way is to drop extra men in coverage and make him hold onto the ball. But facing the much less experienced Jimmy Garoppolo, the Cardinals will probably opt to come after him on nearly every pass. He’s Baaaack, the “Honey Badger” Mathieu is Healthy: Cardinals defensive back Tyrann Mathieu is not only the on-field leader of this defense, he’s the emotional leader as well. His teammates feed off of his intensity and he was missed in the playoff loss to Carolina. He suffered a torn ACL in December against the Eagles, his second serious knee injury in three years. Although he’ll be wearing a small knee brace, it isn’t expected to slow him down much at all. The coaching staff opted to keep him out of preseason action but he was reported to look very good in positional drills last week. 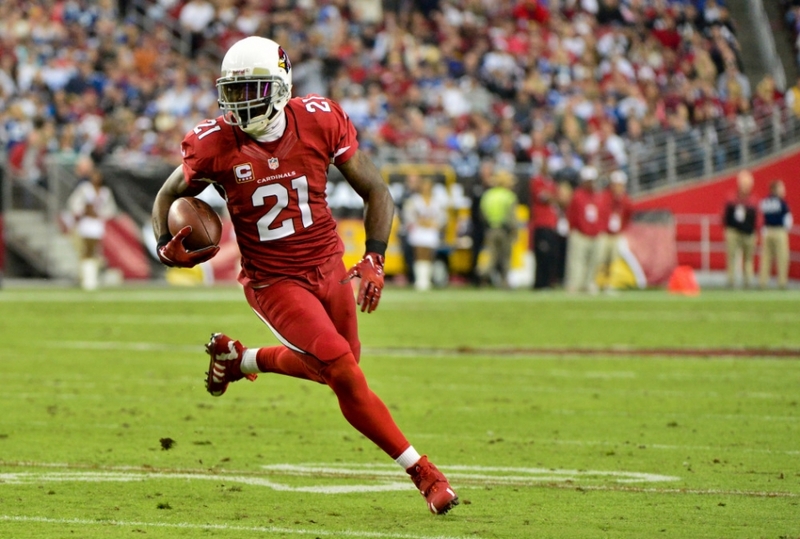 Cornerback a Potential Trouble Spot: One potential area for concern moving forward is the cornerback spot opposite Patrick Peterson. The team had Mike Jenkins but he was injured and tore an ACL and is lost for the season. The team tried both Cariel Brooks and rookie Brandon Williams in the role but both struggled in a preseason win over the Broncos. Williams, a 6’0, 200-pound rookie from Texas A&M, was taken in the third round of the draft (92nd overall), this year. He has only a year of experience playing corner, having converted from running back. Eventually, he’ll be the guy that they hope will work out, but he’s not ready yet. Justin Bethel, the three-time Pro Bowler, who has been hobbled with a foot injury remains in the mix. He missed all of spring OTAs and most of training camp after offseason foot surgery. He’s been admittedly rusty since his return. So the Cardinals made a trade with Kansas City for backup corner Marcus Cooper just a few days ago. Cooper was the Chiefs’ defensive rookie of the year in 2013 but has fallen off the radar the past two years, playing sparingly. The Chiefs tinkered with the idea of moving him to safety this summer. He wasn’t going to make the 53-man roster with KC so the move makes sense for both parties. The Cardinals are hoping that they can catch lightning in a bottle and that the 6’2, 195-pound Cooper can recreate the performance he had in his first nine games with the Chiefs. Since then, he’s been steadily regressing. A change of scenery may be just what the doctor ordered. This will be an area to watch on Sunday night to see if there is indeed an issue there for Arizona and whether or not the Patriots under Garoppolo can exploit it. 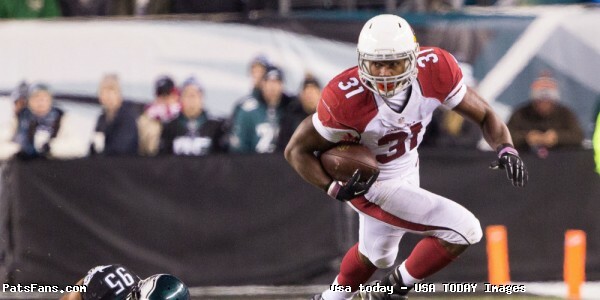 This entry was posted in Patriots Commentary, Patriots News and tagged 2016 NFL Season, Andre Ellington, Arizona Cardinals, Bill Belichick, Bruce Arians, Calais Campbell, Carson Palmer, Chandler Jones, Chris Johnson, David Johnson, J.J. Nelson, Jaron Brown, Jimmy Garoppolo, John Brown, Larry Fitzgerald, Marcus Cooper, Michael Floyd, New England Patriots, NFL, Patrick Peterson, Patriots, Robert Nkemdiche, Tom Brady, Tyrann Mathieu on September 6, 2016 by Steve Balestrieri.